A couple attempts to track down the long elusive Zodiac Killer. There have been more than a few films over the years inspired by the real life Zodiac killer, including Dirty Harry and The Exorcist 3; not to mention the underrated but brilliant 2007 film Zodiac by auteur David Fincher - the definitive last word on the subject. This new telling of the unsolved ‘60s/’70s crimes puts a new spin on it by setting the film in the present day and making the story less about what actually happened and more about an imagined circumstance in which the Zodiac may see cause to resurface. Written by Jennifer Archer, Mike Horrigan and Jonathan Wright (who also directed), this film stars Shane West (ER) and Leslie Bibb (Iron Man 1 and 2) as Mick and Zoe, a struggling trailer park-dwelling couple who buy a storage locker containing footage that may or may not have been filmed by the Zodiac killer himself. Enlisting the help of pawn shop owning buddy Harvey (Matt Craven of X-Men: First Class), they decide to track down the true identity of the Zodiac and claim the long offered reward money that could change all their lives. The dangerous pursuit turns deadly when the hunted becomes the hunter. I have watched my fair share of low budget films, and they all fall down in various ways. Sometimes it’s the story, which is too ambitious for the budget. Sometimes it’s the actors/friends who are clearly not blessed with any thespian talent. Sometimes it’s the fault of the directing style or the editing. Usually though, the biggest issue is with the scriptwriters neglecting to develop characters and being so caught up in the ‘concept’ they fail to see the story. The script itself is intelligent, with some presumption of prior Zodiac knowledge but not to the point where the detail would be lost if you had never heard of the Zodiac killer. Time is taken to flesh out well-drawn characters and their relationships with each other. The central couple are loving, and their chemistry and ease on camera creates a genuine caring for their well-being once things start going wrong. The slightly eccentric friend Harvey is not written as the local nutjob but as someone who has a wealth of hidden knowledge that the couple can utilise. He is a valuable part of the team, as is Zoe, who is not relegated to the ‘nagging wife’ or ‘die for motivation’ roles that so many actresses get lumbered with. Her concerns are treated fairly, she is in the action as much as her husband and she is just as capable – it's most refreshing. Mick is not a caricature of a nincompoop hubby who is off on some harebrained scheme that endangers everyone; he is someone who is struggling to feel like he can live up to his promises of a better future with his wife, and will do what he can to achieve that. The direction is smooth and allows for one or two nice little scares and some juicy tension that ramps up to a well-played finale (though the coda is a tad nonsensical). Acting across the board is well above average. It’s a pleasure to watch these actors embody such likable people. The only complaint I have - and it is a minor quibble in the scheme of things - is that it needed a bit more of a harder edge. If it had ramped up the ‘nasty’ just a little, added a touch more sinister and a pinch more danger, it would’ve been even more impactful. The thrills were slightly too ‘vanilla’ for my taste. Nevertheless, this is a real treat of a movie, particularly if you find the real life story of this killer as fascinating as I do. Fincher’s Zodiac is the best film that has been made about this killer, and will continue to be so, but as a little sister companion piece, Awakening the Zodiac ain’t half bad! 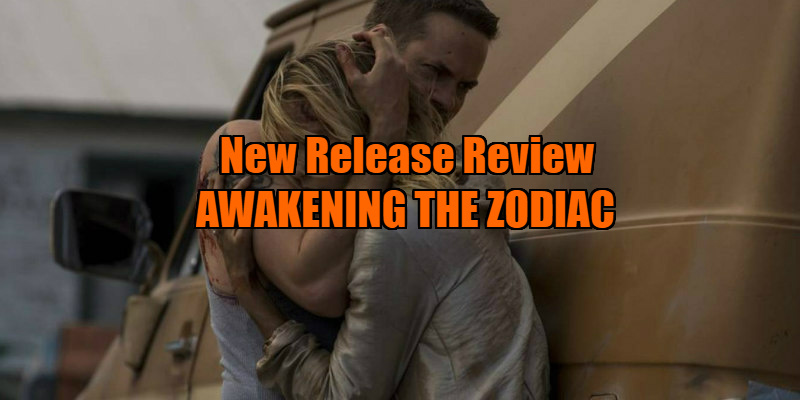 Awakening the Zodiac is in North American cinemas June 9th and on VOD/Digital June 13th.